Smith is a master tea purveyor, sourcing botanicals from far-flung locales—Reggio Calabria in southern Italy for Bergamot oil, and Fayoum, Egypt for his delicate chamomile. He’s also an expert in the art of blending and has a resumé that includes co-founding the globally recognized tea brands Stash and Tazo. His latest venture is Steven Smith Teamaker, and it’s based at his tea shop in Portland. In a twist of irony considering his childhood, Smith has helped transform America’s perception of tea from being the stuff served by grandmothers to a complex, full-flavored and evolving drink spanning generations. The shop closed, but those years of working with botanicals set the stage for Smith’s later success. A friend, Stephen Lee, bought the botanicals from The Gates of Eden and formed Stash Tea. “He was doing maybe $800 a month in sales with Stash,” Smith says. “I had a VW bus that I filled with tea samples, and took off for three weeks. I came back, and I’d sold $15,000 worth of tea.” In lieu of a commission, Smith became an equal partner in Stash. Along with a new additional partner, Smith opened a coffee, tea and spice shop in Portland in 1974 and began incorporating blending into his repertoire. “We would go out and collect forest-floor botanicals,” he says. “In some cases, we would buy entire fields of red clover. We arranged deals with feed and seed dealers, and I began to study medicinal botanicals.” Smith sold his shares in Stash in the early 1980s, but he and Lee continued to work together. By the end of that decade, he’d repositioned the brand’s initial blends and continued—through speaking engagements and public relations—to expand distribution. Stash sold to a Japanese investor in 1993, and Smith set out to start over again. 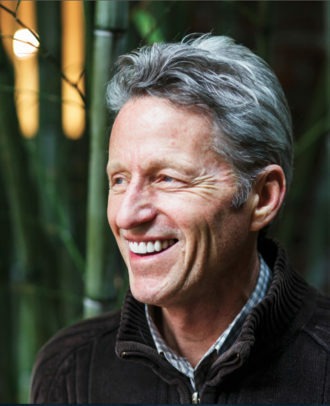 In 1994, he and Lee sat down with copywriter Steve Sandoz and Steve Sandstrom, the head of one of Portland’s top brand-design firms, in a meeting that inspired the creation of Tazo. “They came to me with a line: ‘Marco Polo Meets Merlin,’ ” says Sandstrom. The team knew the marketing had to be accessible and enticing, while also reflecting the quality of Smith’s blends, which would sell at twice the price of familiar supermarket brands and nearly 50 percent higher than other boutique brands. Tazo’s team came up with names that evoked moods. “Instead of simply calling it ‘Spearmint,’ ours was ‘Refresh.’ Instead of ‘Breakfast Blend,’ it was ‘Awake,’ ” Sandstrom says. Smith’s shop in Portland also includes a tasting room, which provides an opportunity to experience his teas firsthand. “The difference here is that we manufacture in an open kitchen environment,” Smith says. “Guests can see it being made, from blending to packaging.” The shop is housed in a 100-year-old building on the edge of Portland’s Pearl District. Four stools flank a tasting bar; other tables and a banquette can accommodate up to a dozen. A long hallway hosts a glass-front cabinet with artifacts Smith has collected over the years, and there’s a bamboo garden out back. Smith is always around—constantly misplacing and relocating his favorite tasting spoon in the frenzy of creation and service, consulting his journals, and making notes on blends. “Creation for me is about starting with the best tea I can find,” he says, and a blend is largely about matching and balancing desired characteristics. “He’s got a phenomenal palate and nose,” says Sandstrom. “He’s gifted in that way. He’s also not afraid to take a risk.” Smith also isn’t afraid to take his tea to new places, including ice cream, cocktails and even barrels. Portland’s Salt & Straw ice cream shop sells Lotus Seed Matcha, with grassy notes of Smith’s green tea and the light caramel notes of lotus seeds and toasted brown rice; more playful still is their Pad Thai Ice Tea option, with Smith’s rich Ceylon red tea, sweetened condensed milk and Southeast Asian spices. At Broken Shaker in Miami, proprietor Gabe Orta reaches for Smith Teas when creating cocktails like his Hibiscus Paloma, with tequila, lemon juice, grapefruit bitters and bitter lemon soda, balanced with a sweetener made from agave syrup simmered down with Smith’s Big Hibiscus blend. Smith has also experimented with the interplay between dried tea leaves and wine barrels. “He has a lovely level of fanaticism for botanicals,” says Dave Paige, winemaker at Adelsheim Vineyard in Newberg, Ore., where black tea leaves were housed in Pinot Noir barrels for several months; the results included barrel-aged blends like the No. 11 Méthode Noir, made from high grown, Ceylon black tea. “He explains tea the way most people speak about wine—about terroir and balance and complexity,” Paige says. Even though he might drink 10 cups in a single day, Smith, like everyone else, has his favorites. He usually reaches for Mao Feng Shui—a green tea from Zhejiang, China, which he describes as being rice-y and slightly vegetal. His other favorite is Bungalow, a blend of first and second Darjeeling grown in the foothills of the Himalayas. Sandstrom, who also covets Bungalow, isn’t shy about his friend’s genius when it comes to tea. “If Steven Smith had an endless amount of money, the world would have an endless stream of cool products,” he laughs. “He’s one of the best new-product inventors out there. We are all underserved by him not being a billionaire. Editor’s Note: Steven Smith passed away on March 23, 2015. This article was originally published in the March/April 2014 issue of Imbibe. 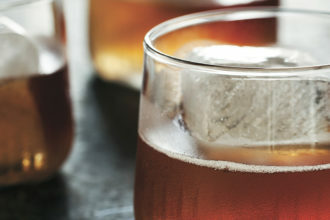 Cocoa nib–Infused vodka tastes equally delicious in cocktails or sipped solo.